The 2015 Athena Film Festival was held at an important time in the history of film and television. It was the fifth year the event was held in Barnard College in New York, celebrating the efforts of films mostly written by, directed by, produced by and starring women. The film festival was created by Women and Hollywood website founder Melissa Silverstein and her friend Kathryn Kolbert who saw a huge gap in the market and believed a festival dedicate to promoting the endeavors of women in the industry would give them an elevated platform like never before. 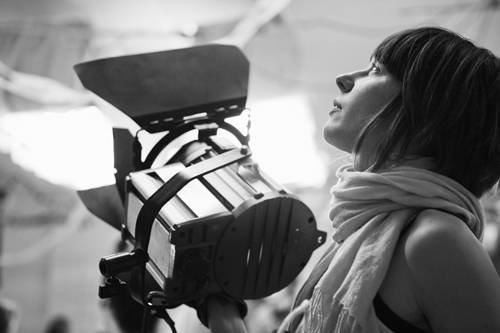 There is a specific focus on female directors and female-centric stories. The event ran from February 5-8 and featured a selection of short and feature films, documentaries and panels designed to honor the women in film whose productions rarely get the light of day elsewhere in the industry. The award was presented to Jodie because her her long career as an actress, director and producer. She has recently directed episodes of ‘House of Cards’ and ‘Orange is the New Black’ on Netflix. The Wall Street Journal spoke to Jodie to get her thoughts on the gender gap that still exists in Hollywood today. Given that she has been working in Hollywood since she was 3 years old (currently she is 52) she has no doubt seen a lot in her journey. However, her first remark was similar to a comment Geena Davis made in a recent interview saying she doesn’t believe there is a sinister plot to keep women out of film, but it is more of an unconscious thing that has been perpetuated year after year. Her solution isn’t just to have more women as studio heads, because they do exist and it hasn’t made a huge difference. Melissa Silverstein added to the idea of women being a “risk”, saying the excuse that women don’t make money at the box office is completely false, and has been proven so time and time again over the past couple of years with huge successes such as ‘Frozen’, ‘The Hunger Games’ and ‘Divergent’ just to name a few. “If they keep buying into this false narrative, then they’re not going to make movies about women. But what we’re trying to do with…the Athena Film Festival is to show that movies about women make money and that you can see a successful that stars women make money and you need to see more of them. You see when they come out, that they do make money,” she said. Kathryn Kolbert adds that the specific inclusion of LGBT women is important to bring intersectionality into the film conversation in a way that has never happened before. It also means more accurate representations of the LGBT community can exist, rather than stereotypes. In her video speech for her Lifetime Achievement award, Jodie said growing up in the film business she rarely saw a lot of women behind the scenes. Director Gina Prince-Blythewood whose film ‘Beyond the Lights’ tells the story of a young black female singer, said she doesn’t believe she is necessarily discriminated against for being black and female. “But what is discriminated against are my choices, which are to focus on women and especially women of color in lead roles, and it’s a tougher fight,” reports the Columbia Spectator. Her comment certainly hits home after the outrage surrounding the shut-out of ‘Selma’ director Ava DuVernay from the ‘Best Director’ category at the Oscars this year. The goal of Athena is to create a culture of change in the film industry, and to give hope to other women that it is possible. What we like about the film festival is that it is also encouraging support and mentorship amongst female filmmakers. Never has it been a more important time to support women in film in order to have a more diverse representation of women’s characters and stories shown on screen. “We have a simple goal here at the Athena Film Festival, and that is to change what leadership looks like, so that when you think of leadership, you picture diverse women making a difference across the globe,” Kathryn Kolbert said.